Ballina in Ireland-West is a perfect choice for a great holiday or a fun short break in County Mayo. Find out more about Ballina below. 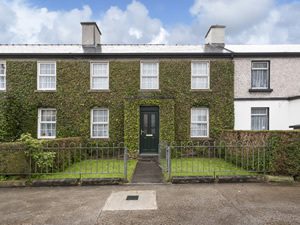 A delightful home a mere stroll from Ballina town centre less than an hours drive from Sligo town. Comfortably furnished with all the comforts of home making this an ideal base at any time of year. Ballina sits on the river Moy a renowned salmon fishing river whilst boats can also be hired for salmon or trout on Lough Conn a short drive away. Great days out can include Croagh Patrick, Ceide Fields, Museum of Country Life, stroll along the stunningly beautiful beach at Enniscrone or visit Westport which hosts an abundance of music and hospitality.Shop. Pub. Restaurant 880 yards. Beach 8 miles. GF: lounge, kitchen/diner, utility room. FF: double, 2 singles, bathroom with shower over bath.Electricity and oil central heating included, linen and towels included, cot, high chair, stair gate, TV, dvd player, CD, freezer, microwave, dishwasher, w/machine, hairdryer, electric blankets, alarm clock, welcome pack, fully enclosed garden, garden furniture, locked shed available for storage, on street parking. Sorry no pets. We have the following details listed regarding Ballina accommodation accessibility but we would recommend that you always confirm these prior to booking with the owner or operator. Ballina is a great base to explore the wonders of County Mayo and you will find plenty of activities near by. Ballina is at River Moy, County Mayo. Check out the map below for directions, use the controls to zoom in. If you have stayed at Ballina why not add your thoughts, comments, pictures to our Facebook page? Don't forget to add the name/town/page link to your comment so its attributed to the correct place. Please keep it polite, we are sensitive souls! Find Cottage Holidays works closely with independent cottage owners and leading holiday travel operators to provide you the widest choice of self catering accommodation across Ireland. Ballina in County Mayo is available through: Imagine Ireland. If you are heading to County Mayo then check out our guides to local holiday attractions, gardens to visit and county shows to see.